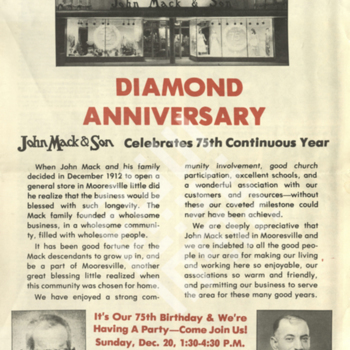 A program printed in honor of the Diamond Anniversary celebration of John Mack & Son Department store in Mooresville, North Carolina. The program contains photographs from the store's 75 continuous years of operation and includes an early history of the Mack family. John Mack & Son, “John Mack & Son 75th Anniversary Celebration Program,” Moise A. Khayrallah Center for Lebanese Diaspora Studies Archive, accessed April 22, 2019, https://lebanesestudies.omeka.chass.ncsu.edu/items/show/11447.